Some of you may remember that I covered Wild Dawn a bit back in January. I was impressed by their live performance at Paris Metal France Festival, they have a good handle on what they want to do. Yet their last record, Double Sided, it lacked something. It was not as polished as it could have been, some of the vocal lines were a little off. Some of the guitar riffs weren't as powerful as the band might have liked. Let's just say, all of those concerns can be tossed out the window with the bands latest release, Pay Your Dues. With raging tracks filled of rock and roll riffs, this is an album for the ages. One of the first things that struck me about this record is how it sounds like a distinctly American album. Be it in the vocal delivery, or simply the style of riffs. There is something about this band that reeks of groups like Aerosmith and the like. The guitar playing on this latest release is simply phenomenal. The riffs are well structured and very hooky. Sure some of the solos are a bit long, but that's easy to forgive in the context of the whole record. Another note, the song structures are excellent. Their is rising and falling action, clear progressions and often sing a long passages. 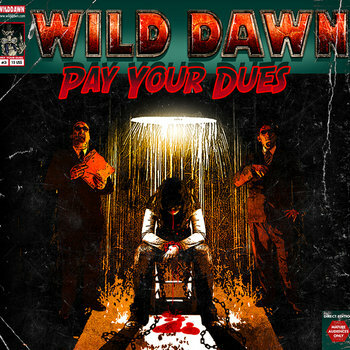 The rock and roll grit that makes Wild Dawn so good has never shined so intensely as it does here on Pay Your Dues. So, if you want an album that will take you back to the good old days of rock and roll music then be sure to run over to the Wild Dawn Bandcamp page and give this record a listen. These guys seem invincible, almost all of the flaws that made their last record so wanting have been covered up and they have a new and exciting energy to drive them forward. Yet their full potential has yet to be achieved I think. Sure they understand rock and roll madness, but can they live it? Will the next record be able to transcend Pay Your Dues and fully embrace rock and roll anarchy? Only time will tell. As for now, content yourselves in knowing this is one of the best pure rock and roll records of the year.